Binding is found on many instruments and can be used along the outline of the top, back, peghead and fingerboard. Not only is binding decorative but it also serves to protect and seal the end grain of the wood. Shrinking binding can often be reglued if its condition is still solid. Extreme or fluctuating temperature and humidity levels can cause binding to loosen. Wood will expand and contract as the humidity changes, the more drastic the changes, the more stress to the glue joints. To prevent stressing the glue joints an instrument should be kept properly humidified. Celluloid's deterioration can be so severe that replacement is the only option. Severe deterioration of the bindings and celluloid pickguard on certain vintage instruments can also effect the surrounding area by causing corrosion of nickel and other discoloration, particularly when the instrument has been stored in a closed case for decades. 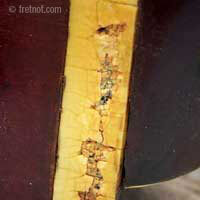 A common area to see binding cracks is at the end of the frets. When fingerboards shrink due to dryness the frets may extend past the edge of the shrunken fingerboard placing pressure on the binding. This results in fine line cracks at the ends of the frets. If binding has seen considerable shrinkage or been subjected to humidity and temperature changes, the binding may come loose from the body or neck. The tight area of the waist is a very common spot for binding to loosen. If the shrinkage is minor the binding can sometimes be gently pushed back into place and reglued. Considerable shrinkage leaves the binding too short to simply force back into place as the tension would surely cause it to pop loose again or not seat properly. In instances where the binding has not cracked but has simply come unglued I frequently choose to loosen the binding to the point of the manufacturer’s original seam to remove the tension created by shrinkage. To avoid damaging the finish, Titebond is often used to repair small areas of loose binding after the channel and binding has been scraped. Binding loosened to factory seam at heel. Masking protects instrument from strong adhesives that damage finish. Binding on the fingerboard and body can develop cracks, especially if the instrument has been thru extreme temperature or humidity changes. Loose binding is easy to snag and break. A fingerboard can shrink if humidity levels drop too low. As a result the frets are then wider than the board, placing pressure on the binding which can cause cracks near each fret.. Be sure to address humidity concerns to avoid more damage. Because binding is under the finish, removing it will cause chipping of the finish along its edges. This is a consideration when choosing the proper method of repair. Instruments with thinner finishes may show far less evidence of a binding removal and repair than one with a very thick finish. Generally speaking refinishing is avoided when regluing loose bindings and repairs are noticeable but not terribly unattractive. Replacement of binding often requires finish work. While the type of adhesive used for binding repair will vary according to the type of binding and the situation, many of these adhesives are harmful to the finish itself. Extra care must be taken to thoroughly protect the finish when performing binding repairs. Binding is usually made from celluloid, plastic or wood. Plastic binding may be white, ivory, ivoriod (ivory with "grain" lines), black or tortoise. Wood binding can be made from numerous species and dyed any number of colors. Copyright © 2012 Fret Not Guitar Repair Inc.